"This report was brought to you by sand. Get used to it, it's everywhere." After the success of 1994's The Return of Jafar and a subsequent TV series, Disney decided to produce one last direct-to-video sequel to make a couple extra million while exploiting consumer good-will and devaluing its brand. Oops, I mean, to wrap up the Aladdin saga. Aladdin and the King of Thieves has one thing going for it�Robin Williams is back as the hyperactive Genie, replacing Dan "Homer Simpson" Castellaneta, who manned the microphone for the first sequel and TV series. He brings the same energy to the role that invigorated the first film, even if the routine is getting a bit old (many of the Genie jokes were apparently deleted ideas from the 1992 feature). The rest of the vocal cast has also returned, including Gilbert Gottfried as loud-mouthed parrot Iago, now a good guy. The plot feels a little thrown together, an obviously strained extension of a story that should have ended after one movie. On the eve of his marriage to Jasmine (Linda Larkin), loveable, orphaned street rat Aladdin (Scott Weinger) discovers he might not be so alone after all when he hears rumors that his father (Jonathan Rys-Davies) is still alive, and head of a group of criminals known as the 40 Thieves. The two eventually team up against a sinister villain, voiced by the late Jerry Orbach (ka-chung!). Whenever a series decides to rewrite history to such an extensive degree (after all, much of Aladdin's charm was built on his lowly origins, and now suddenly he's the son of a legendary thief? ), you know it's time to take the franchise out back and give it the Old Yeller treatment. Which is what Disney did, thankfully, though I'm not giving them too much credit considering they've since beaten more or less every one of their animated classics into the ground. Unless I'm wrong. Do your kids really want to see Roo's Big Movie or Eeyore Takes a Zoloft? On the plus side, King of Thieves looks a lot better than Return of Jafar�once Disney knew the direct-to-video route was a moneymaker, the company began to put more time into the animation. It's still not on par with a theatrical release, but the movement is smoother, the colors are brighter, and the backgrounds are more detailed this time around. The DVD looks better too, with a sharper image that looks cleaner than Return of Jafar, but which still looks like it could use a decent re-mastering job to clear away some dirt and scratches. Unfortunately, the original full frame image has, for some reason, ben lopped off to 1.78:1. I looks misframed, and is clearly a mistake since the film went straight to video (the box indicates a full frame transfer). Still an okay transfer, though the 5.1 audio track still sounds like little more than basic 2.0. Extras Review: The extras package for King of Thieves just about matches the one for Return of Jafar: two kid-friendly interactive games and a bunch of promotional trailers constitute the bulk of the extra material. This time around, though, there is also a four-minute Behind the Microphone piece, a standard extra for Disney releases, with brief comments from different members of the cast and some footage of Robin Williams doing his thing. Interesting, but short. Aladdin and the King of Thieves benefits from Robin Williams return to the role that made him a voice-over star, but despite some bright spots, the direct-to-video sequel has little of the charm of its theatrical forebear. 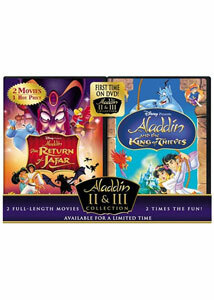 For Disney completists only (put it on the shelf next to your copy of Pocahontas II).